I am so excited to share one of my favorite sweaters for fall with you all! The cropped style of it could not be more perfect for all of the high-wasted cuts that are totally in this season, especially because it hits at just the right spot! This sweater also provides a twist to the preppy cable knit classics that we have grown to love! 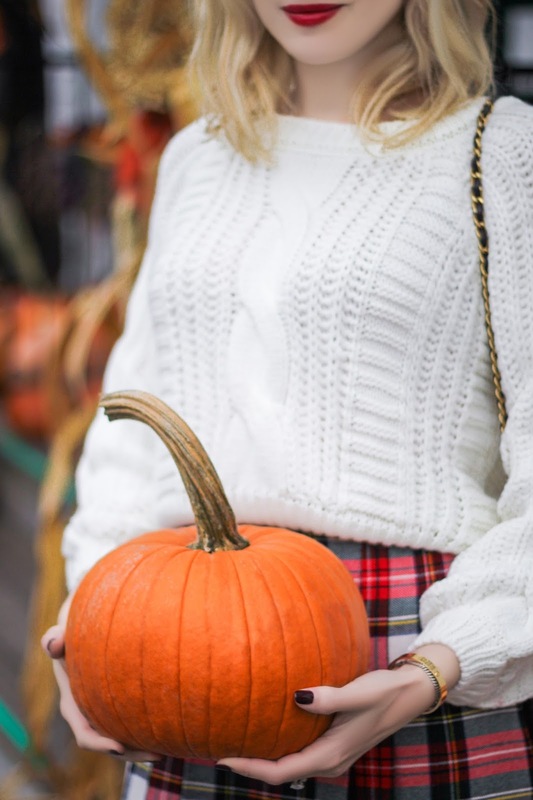 I had originally styled this look with a pair of cute jeans, but when I came across this tartan vintage skirt on my stroll around Woodstock, Vermont, I knew it would be the perfect match for this sweater! I must say, this is one of my favorite looks thus far - I totally felt like a college prep from the seventies, and I loved every minute of it! If you're in the Woodstock area, you must check out Encore Designer Consignment , the gem of a store where I found this plaid dream. Also, be sure to tune in tomorrow for details on my weekend in Vermont!